Atlanta, GA - Theodore “Dutch” Van Kirk, the last surviving member of the Enola Gay plane that dropped the atomic bomb on the Japanese city of Hiroshima on Aug. 6, 1945, has died at a retirement home in Georgia at age 93, media reports said. Van Kirk was the navigator on the flight that dropped the first nuclear bomb used in warfare. He later told reporters that after seeing one atomic bomb explode in war, he never wanted to see another one used again. But he defended the use of the bomb, describing it as the lesser of two evils when compared to the continued aerial assault of the Japanese main islands and a planned U.S. invasion. “The bomb really saved lives, in spite of the tremendous number of casualties in Hiroshima and Nagasaki, because the destruction that would have been caused in Japan otherwise would have been tremendous,” he said in an oral history for Georgia Public Broadcasting. 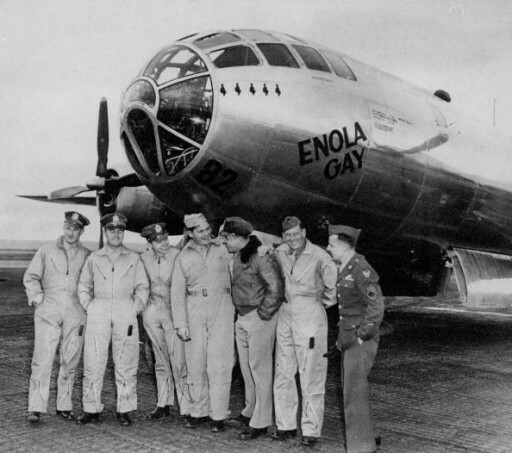 The U.S. B-29 Superfortress Enola Gay, carrying 12 crew members, dropped the atomic bomb, nicknamed “Little Boy”, on Hiroshima in the closing days of World War Two. The death toll from the blast by the end of the year was estimated at about 140,000, out of the total of 350,000 who lived there at the time. Three days after the Hiroshima bombing, the United States dropped an atomic bomb nicknamed “Fat Man” on Nagasaki. Japan surrendered on Aug. 15, 1945, bringing World War Two to an end. He said that 43 seconds after the bomb was dropped, he saw a flash from the blast. A shockwave then came and shook the aircraft. Officials at the Park Springs Retirement Community in Stone Mountain, a suburb of Atlanta, confirmed his death, the Atlanta Journal-Constitution reported. Local broadcasters also quoted his son as confirming the death. A funeral for Van Kirk is planned for Aug. 5 in his hometown of Northumberland, Pennsylvania, the paper said. To #1- You are correct; however, the month used under the photo was also wrong, as Hiroshima was bombed on August 6, 1945. the article wrongly stated April 6, 1946. It always amazes me how not only this specific article has the wrong date, but how television news anchors and reporters, constantly make errors pertaining to historical dates. I can't remember his name, but there was a Jewish crew member, who flew on both the Hiroshima and Nagasaki missions. "infamous B-29 plane" That's a political statement..."famous" would be more appropriate. From Wikipedia: Army Air Force radar specialist Jacob Beser was the only man who served on both the Enola Gay in the Hiroshima bombing mission and the Bock's Car three days later when its crew bombed Nagasaki.